Dr. Sumner joined the RVSB in 2014 as the Artistic Director and conductor of the band. Dr. Sumner made his inaugural debut as Artistic Director and Conductor in June 2014, at the annual RVSB Pops concert ”Let Freedom Ring”. For 14 years, he has been the Instrumental Music Director at Piscataway High School in Piscataway, New Jersey. Prior to that appointment, he taught at Rutgers University, Seton Hall University and Union County College. He received his Master of Music from Mannes College of Music and his Doctor of Musical Arts from Rutgers University. “Doc”, as he is affectionately known in school, is also an active professional musician—as a conductor and performer. In addition to his tenure at Piscataway H.S. 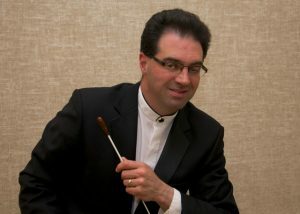 as director of the Wind Ensemble and Orchestra, he has also been a guest conductor for the New Brunswick Chamber Orchestra, and Rutgers University Wind Ensemble, as well as assisting Maestro Mariusz Smojli with the Riverside Symphonia. He has conducted and played in dozens of musicals and is currently the reed substitute for the Hunterdon Hills Playhouse. Dr. Sumner is also the associate principal clarinetist of the Riverside Symphonia for which he is also the personnel manager and contractor. He has also performed with numerous other orchestras, concert bands and jazz bands across the country, including the Allentown Symphony, Manhattan Chamber Orchestra, and Aspen Jazz Ensemble, as well as with Linda Ronstadt and Aaron Neville on their East Coast Tour in 2004. Dr. Sumner has recorded on the Mark and Capstone record labels and has also been published by Grand Mesa Music Publishers for his string orchestra arrangement of “Flow My Tears” by John Dowland. In 2005, he was awarded the “William D. Revelli Award” for Best Overall Concert Band in a competition with the Piscataway High School Wind Ensemble. His conducting teachers have included Dr. William Berz of Rutgers University (and past conductor of the RVSB) and Mr. Peter Rubardt, artistic director of the Pensacola Symphony. Dr. Sumner’s most recent accomplishments include being accepted into the Julliard School Summer Conductor’s Symposium, and being nominated as a semi-finalist for the “GRAMMY Signature Schools Award” 2014, sponsored by the Grammy Foundation.